An actress who appeared on The Bill has told of her shock after her five-year-old daughter was diagnosed with a brain tumour. 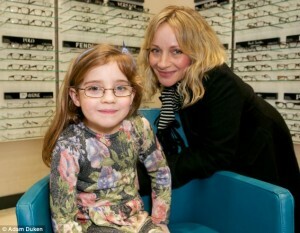 Kaye Wragg’s daughter, Matilda, was diagnosed with a plum-sized tumour after a routine trip to the optician. Matilda was seen by Manpreet Bahra who was concerned that she was unable to read even the largest letters on the chart despite previously having been able to. She checked the health of Matilda’s retina and found signs of raised pressure within her brain. As a result, she referred her to hospital immediately.